Gillian is a garden fairy. She likes to sit in the clematis and watch what’s going on while no one can see her. 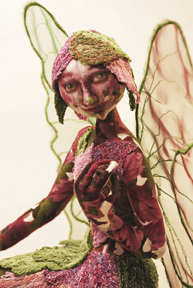 Her hair and clothes are made from free motion embroidered leaves. Cotton fabric, cottton thread organza, rayon thread, wire, chalk pastels polyester.